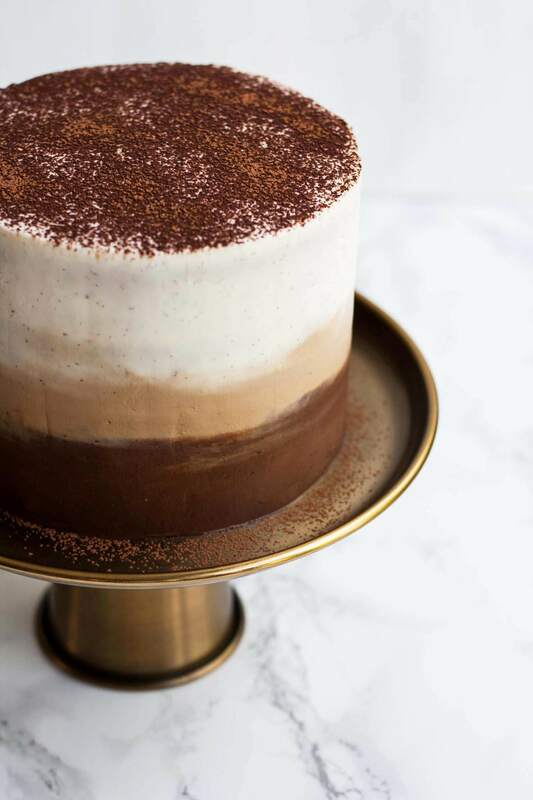 This Tiramisu Layer Cake is an ideal indulgent celebration cake for all lovers of coffee, chocolate and of course that delicious Italian classic, tiramisu! THIS CAKE. Oh, promise me you’ll make it? I’m aware it’s not immediately evident here on the blog, but I love to bake. I started to bake back when I was a kid, way before I learnt to cook actual meals. Baking is what I did to avoid boredom, my favourite weekend activity growing up in a rural village, far away from my school friends. I loved to get creative in the kitchen, adapting recipes as I saw fit to keep things interesting. And more recently, I fulfilled a dream of mine – to bake my own wedding cake. And it was beautiful, a 6-tier tower of elegant vanilla cupcakes, topped off with a 6 inch chocolate layer cake (with vanilla frosting!) for the chocolate-loving bride and groom. It was simply decorated with white sugar roses, white sprinkles and three pastel roses on top. It was perfect. Anyway – back to this cake. 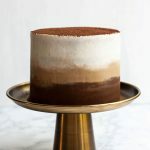 Tiramisu Layer Cake with Ombre Mascarpone Frosting. This is the cake my dreams are made of. If you were to ask me what my favourite dessert is, chances are my reply would be tiramisu. Now, I’m a dessert lover and there are a lot of desserts I like. My favourites are anything with chocolate, caramel or coffee. Those are my favourite flavours and I’d far sooner pick one of those than a fruit-based dessert (although I love fruit desserts too and you can expect one on the blog soon!) But what would I pick out of all those if I could only pick one? What will I immediately go for if I see it on a menu? It has to be tiramisu. I just love the stuff. If my husband and I find savoiardi biscuits on sale in the supermarket, we’re in trouble. We inhale the stuff. Eep. So, it was my birthday last Sunday and I love to bake something special to celebrate. This year, it simply had to be tiramisu in cake form. 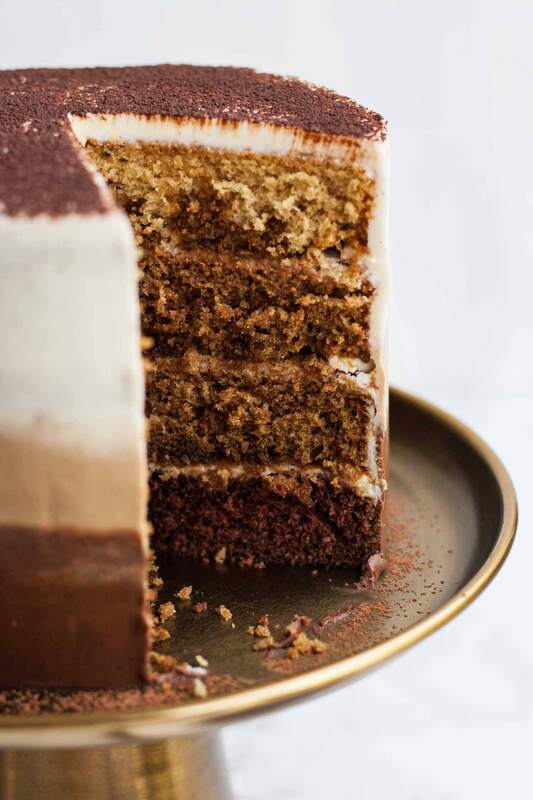 A tiramisu layer cake. Once the idea had been conceived in my mind, that was it, it had to happen. AND IT DID. I was keen to make a layer cake with ombre frosting as I’ve never tried that technique before. It was surprisingly easy and the effect was incredible! Naturally, the cake layers had to be chocolate, coffee and vanilla. I don’t actually use vanilla when I make a genuine tiramisu but you can’t go wrong really, can you? I made a simple coffee syrup to soak the cake layers but I wished I had made more. As such, the recipe as written calls for twice the volume of syrup that I actually used but I’m absolutely confident it will work just fine for you. Alternatively, if you didn’t fancy making a syrup, you could soak the cake layers with a coffee liqueur instead – Kahlua would be perfect! The pièce de résistance, however, is that frosting. Oh my dayz. Now, I’m a buttercream lover but come on, we can’t be putting buttercream on a tiramisu cake, can we? It just wouldn’t be right! This mascarpone frosting is perfect in so many ways. It’s oh so creamy and just subtly sweet – I’m not making health claims here but it was refreshing to make a frosting that wasn’t mostly made up of sugar. The other thing? It’s super easy to make. Bring your mascarpone up to room temperature and stir your sugar in with a spatula or wooden spoon and you’re done. Love it. The recipe makes a lot of frosting – more than you need – but that’s no punishment, let me tell you. It’s almost frightening how easy it is to eat! I assure you, you’ll find ways to finish it off! Plus, it really is handy to have more than you need so that you can patch up any mistakes you might make when frosting the cake. So, to be clear. 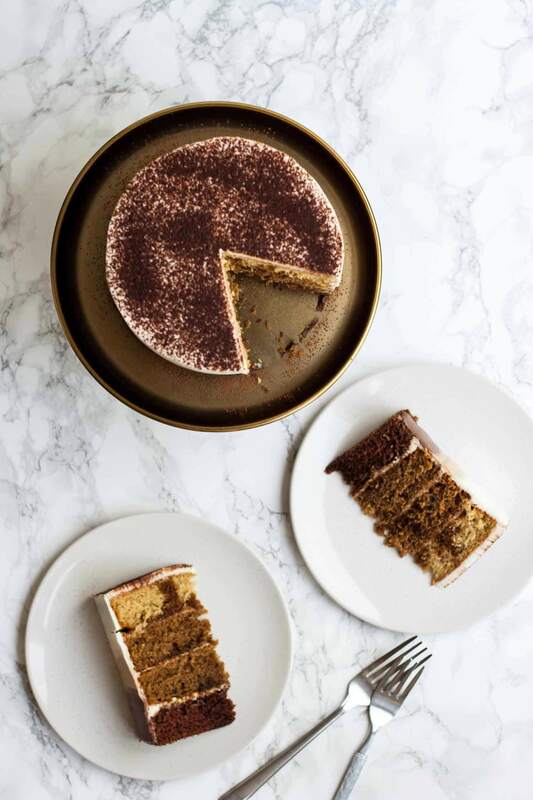 This tiramisu cake is made up of four fluffy sponge cake layers – one chocolate, two coffee, one vanilla. Each layer is soaked in rich, sweet coffee syrup and sandwiched with unctuous mascarpone frosting. And then the entire cake is covered in the same mascarpone frosting, in chocolate, coffee and vanilla and dusted generously with cocoa powder. The result? Utter bliss. I couldn’t think of a better birthday cake. Preheat the oven to 160°C fan/180°C/350°F. Grease and line 2 (or 4 if you have them and the oven space!) 6" loose bottomed cake tins. Start by making the base cake mixture. You can make this like you would a regular cake, by creaming the butter and sugar, then beating in the eggs, milk and vanilla and then folding in the flour and raising agents. However, as you're going to be splitting the mixture and adding more flavourings, it really is easiest to simply make this in the food processor. The results are just as good. To prepare the cake mixture in the food processor: place the butter, sugar, flour, baking powder and bicarb into the bowl of the food processor. Pulse a few times until the ingredients are combined. Add the eggs one by one, processing briefly after each one. Finish by adding the milk and vanilla seeds and process until just combined. Take care not to overmix the batter. The next stage requires just a little bit of maths if you'd like to be accurate, but don't worry if you don't have scales or don't want to do this. Weigh the entire batter mix. You then want to separate the batter into 3 portions - half and two quarters. Into the largest portion, carefully fold in the espresso powder. Into one of the smaller portions, fold in the cocoa powder. Leave the remaining smaller portion as it is. Split the coffee mixture between the two tins and level the tops. Place in the oven and bake for 20 minutes or until a skewer inserted comes out clean. Leave to cool for 5 minutes in the tin before removing and transferring to a cooling rack. Clean the tins, grease and line again and pour the vanilla and chocolate portions of the batter into each one. Bake as above. Place the espresso powder, sugar and water into a saucepan. Bring to the boil and stir until the sugar has dissolved, Remove from the heat and cool. Place the mascarpone into a large bowl. Add the icing sugar, 1 tablespoon milk and the vanilla seeds. Using a spatula, stir together until the mixture is smooth, adding up to another tablespoon of milk if needed. Separate the mascarpone as you did the cake mixture - into roughly half and two quarters. If you choose to weigh it, aim for two portions of about 125 g, leaving the remainder in the original mixing bowl. Melt the chocolate in a heatproof bowl over a pan of simmering water. Leave to cool for one minute. After this time, stir the chocolate into one of the smaller portions of mascarpone. Stir the espresso powder into the other smaller portion of mascarpone. Leave the biggest portion as it is. Level the tops of the cakes using a bread knife if necessary. Pour the coffee syrup evenly over the tops of the cakes and allow to soak in. The cake will be easiest to assemble if you have a cake turntable in order to achieve a smooth frosting. If not, don't worry, you can go for a more rustic look! Place the chocolate cake onto the turntable (or cake stand). Spread a small amount of the vanilla frosting on top (you can do this as thick or as thin as you like, as there will be plenty of frosting). Place a coffee cake on top, followed by more vanilla frosting. Repeat with the remaining coffee cake and the vanilla cake, each time filling with vanilla frosting. Roughly spread some vanilla frosting over the entirety of the cake (crumb coat). Place in the fridge to set for 15 minutes. Once chilled, begin the ombre frosting. Starting with the chocolate frosting, very roughly apply the frosting to the bottom quarter of the cake. Next, roughly apply the coffee frosting to the next quarter of the cake. If the two layers overlap, that's good! It adds to the ombre effect. Cover the rest of the cake roughly with vanilla frosting. You will have leftover frosting which is helpful if you need to do any touch ups! Smooth out the frosting to achieve a clean finish as in the photos above, or leave the frosting more rustic if you prefer! Using a spatula, carefully transfer the cake to a cake stand. Dust the top of the cake liberally with cocoa powder for that final tiramisu touch. Here's a helpful video tutorial for ombre frosting. This recipe makes a 4 layer 6 inch cake. If you wanted to, you could make an 2 layer 8 inch cake - just bake the cakes for 25 minutes each instead of 20. If you wanted to make a 4 layer 8 inch cake, simple double the cake recipe and bake for 25 minutes. I'd imagine you'd need to 1.5x the frosting recipe but you'd have to use your judgement for that. The recipe for the cake layers is slightly adapted from Primrose Bakery - their book Cupcakes from the Primrose Bakery is like a bible in my house. They are my go-to for any cupcake/cake recipes - the quality is incredible! I used their recipes to make my wedding cake and it turned out perfectly. I can't recommend them enough. I must visit one of their bakeries next time I'm in London! And for the record, their other books are fantastic too, but this is the one that has been on my shelf for years. UPDATE: I’m really grateful for Lindsay and Celine who kindly let me know that they had trouble when making the chocolate portion of the frosting. They found that when they added the chocolate to the mascarpone it went runny and gritty. As a result of this, I chose to re-test that part of the recipe to see if I could figure out what was going on. When I tested the recipe, I made 3 separate batches of the chocolate part of the frosting. For each batch, I let the chocolate cool for a different length of time, to test the effect it would have and to determine which was the best method. I let the first batch of chocolate cool for 1 minute, the second for 5 minutes and the third for 10 minutes. I was not able to recreate the issue that Lindsay and Celine had, but by far and away the best frosting was made when I let the chocolate cool for a minute only. The chocolate was still pretty hot in this instance, but resulted in a glossy, soft and easy-to-work-with frosting. When the chocolate had cooled for 5 and 10 minutes, the frosting still worked well, but took on more of a mousse-like consistency. Adding about a teaspoon of milk returned the frosting to a more glossy consistency, however, so if you were to leave the chocolate to cool for longer than 1 minute, the recipe would still work. Celine mentioned that she had made the recipe on a hot day and wondered if that had affected the outcome. When I retested this it was on a cool day (about 17°C) but when I first made the cake it was a lot warmer, about mid-twenties. The recipe worked for me both times. The only other thing I would say is to ensure you use good quality ingredients – the chocolate I used was 74% cocoa although I’m sure anything around 70% would be great. Don’t even ask me for a nutrition label – this is a celebration cake!! Indulge! oh my god this cake is incredible! i love the photos and how perfect the frosting is! Aww thanks so much Aimee! That means a lot as I’m never quite happy with my photography! This looks incredible! Love the ombré. Where is the cake stand from? It’s beautiful. Thanks Ruth! The cake stand is from H&M! Isn’t it gorgeous?! This cake is drop dead gorgeous! I’ll definitely be making this soon! I really hope you do make it Lindsey! I’d love to see it if you do!! 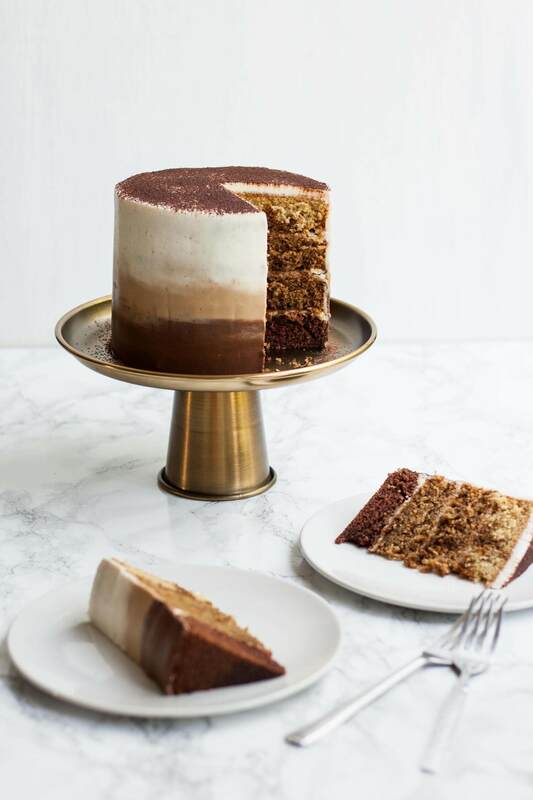 This is an absolutely beautiful cake and I soooo love tiramisu AND my birthday is coming up so I should probably make this for myself as well! Wooooooow!!!! Sasha, that cake looks absolutely gorgeous! And the photography is amazing, too! OMG this looks lovely!!! That frosting ??? I do hope you had a good birthday. Just a wee question, if I may – did the 4tsp of baking powder affect taste/texture? It just feels like a lot but your pictures evidently show no negative side effects ? It looks super amazing, can’t wait to give it a try!!! Just made this for my mum’s birthday. https://www.instagram.com/p/BJCfzgyA5-K/. The only thing I had trouble with was the chocolate icing. I found adding the chocolate made the icing go extremely gritty and sloppy – I wonder if the chocolate hadn’t cooled enough? Luckily I had additional vanilla so just added cocoa powder to that and it did the job. Hey Lindsay! I’m thrilled to hear that you made the cake – it looks delicious! That’s really valuable feedback about the icing. My instinct would be that you didn’t let it cool enough – I left mine to cool for quite a while so I’ll adjust the recipe to reflect that. I’m happy that you were able to salvage it though! This looks amazing, and yes, the photography definitely adds to the effect. Beautiful, so much talent!! I’m going to try it this weekend for my dad’s birthday; I’m a bit (very!) nervous, but the instructions are so clear that I hope it turns out at least partly as expected 🙂 thanks for sharing! I did it, I made it! and I had lots of fun doing so 🙂 It is far from being as perfect as yours and I picked up a number of lessons along the way that I’m happy to share. First, let me say that I am not an experienced baker, so I probably failed where others would have found better solutions. To start off, there is a heat wave in Brussels these days, and that does not go well with (any sort of) baking, and I don’t have any air-conditioning in the apartment… I tried to assemble the cake as quickly as possible, but the mascarpone frosting warmed up way too quickly and ended up being very runny. I guess I should have taken the time to let it cool again after adding the different ingredients and before spreading it. Because the frosting was not very firm, I could not get a thick enough layer between the cakes or on the sides which was a bit lacking for the overall taste balance. Also, I did not manage to get that lovely dark colour for the chocolate mascarpone frosting. It ended up gritty and a pale colour (a bit like Lindsay described) and I had let it cool for over 30 minutes (the bowl and content were cool). Does it still need to be slightly (ever so slightly) warm? My cakes came out really flat (about 1cm thick), but I think there are multiple reasons for that: I started with the blender but the batter just would not blend, so I moved to a regular stand mixer but the ingredients were not in the right order for that. Just a question, how soft is your butter for preparing the cake batter? Because of the heat, I was very afraid that the whole cake would collapse, so I did not dare pour all the syrup on the cakes – well I should have, it was a little dry. I watched the video for the ombre frosting, but it was my first try so it wasn’t as neat, although there was a good blend starting there. Hey again Celine! Thanks so much for your feedback – it really is very valuable to me. Your cake looked lovely! How did it taste? I’m sorry to hear that you had difficulty making the frosting. I’m going to test the recipe again and see how it turns out. It’s really important to me that the recipe is clear and works well so I’m going to try and get to the bottom of this! As for the cake batter, it is important to use soft room temperature butter so that all of the ingredients incorporate properly. I don’t recommend using a blender to make the batter, but you can use either the food processor or a stand mixer! Thank you Sasha, I can’t wait to try it again! Thank you so much for sharing this recipe! I’ve just thoroughly impressed my family and friends making this cake for my partner’s birthday. I’ve never attempted a layer cake before, nor has my icing extended beyond pouring some ganache or buttercream on top. This was the nicest cake mix I’ve ever tried too! I ate way too much mixture making it. Anyway I doubled the recipe and it still only needed 20 min per cake. They cooked perfectly and ended up having quite a large crumb. I froze them then iced the next day and the ganache drip added a lovely touch. Not to mention it tasted amazing too! Hopefully you can see how beautifully it turned out here. https://instagram.com/p/BLS36mzgD-0/ Thanks again for sharing! Hello! I’m making this cake this evening, but I was wondering what you’d recommend as to storing it. I’m assuming the fridge would be the best once it’s assembled. Just a couple of twists. I added some whipped double cream in the frosting to make it more fluffy and soft. I also added cognac in the frosting and in the syrup, too. It turned out amazing! Hi Sasha, I came across your recipe and decided to give it a try. The cake was amazingly delicious! And I just wanted to let you know that I posted it on my blog and shared your recipe link. Thank you for sharing such wonderful recipe. This looks amazing! 😀 Just wondered where’s best to store it once it’s made? …fridge or room temp? Container or not? Thank you! Hi Beth! So glad you like the cake! When I made it I stored it uncovered in the fridge – but let’s face it, it didn’t last long! I’m not a fan of keeping sponge cake in the fridge but I didn’t really want to leave the mascarpone at room temp since it was summer at the time. You might be ok at this time of year but that’s up to you to decide what you’re comfortable with! Hi I would like to know if it is possible to cover the tiramisu cake with fondant. Hi Reynaldo – you could certainly cover this cake with fondant, although it wouldn’t really taste like tiramisu then! If you’re planning on keeping it for a while, I’d recommend filling the layers with buttercream or jam instead of mascarpone as it will keep better. If you’re planning on eating it soonish though, you could still fill the layers with the mascarpone frosting for that tiramisu taste! 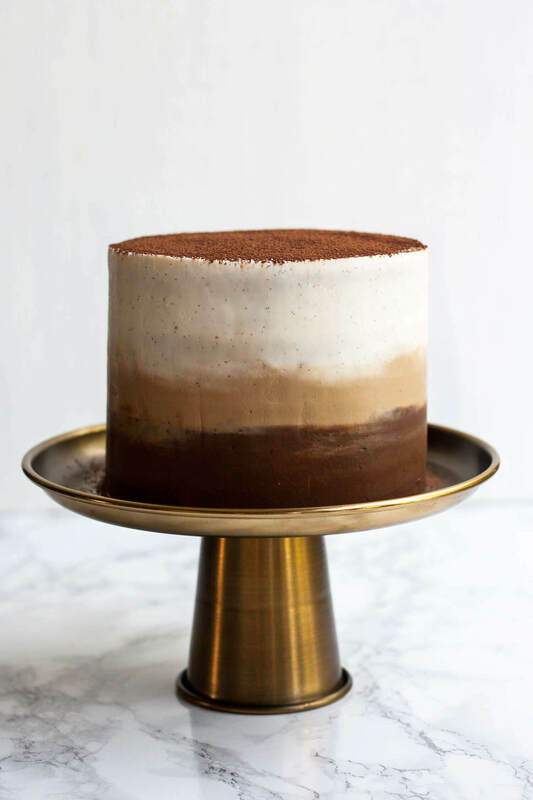 This cake looks amazing and perfect to try for my tiramisu-loving hubby’s birthday! I’ll share how it goes if I do manage some home baking in between building works going on at home and preparing for the impending arrival of a new tiny person in our family lol. I know I’m a little ‘late to the party’ with this, as the post is not recent. However, on the chocolate frosting issue that your readers had – I wonder whether it was about the temperature of the mascarpone when the melted chocolate was stirred through it? I think if the mascarpone was fairly cool, it would mean the chocolate would cool quickly on bring stirred through it and I think that would cause it to go grainy? As for the chocolate frosting, it’s really hard to tell what the issue is in individual cases. I know that when I used just melted chocolate and fairly cool mascarpone, it worked out fine! I had a lady email me recently who was having issues based on the brand of mascarpone she was using! I hope it works out for you – do let me know if you have any issues! Hi. Is it possible to substitute the mascerpone with cream cheese? Hi Mahdiyah, you could definitely give it a go! I think cream cheese would taste more tangy than mascarpone but as long as you’re ok with that, then fine! The consistency will probably be different though so I can’t guarantee that the frosting would turn out correctly. Let me know how it goes if you try it! Hope you love the cake!! Can you explain a little further what you mean by ‘replace the volume of liquid of coffee you use for the milk in the cake and frosting’? If I need to dissolve the instant coffee ( as I don’t have espresso powder ) do I need to reduce the amount of milk in the entire recipe? I’m a bit confused. Ah right – sorry! I see that the way I’ve worded this could be a little confusing. So to clarify, I mean that if you were to dissolve the instant coffee in 1 tbsp of hot water, you would need to reduce the volume of milk added to 2 tbsp. Or you could dissolve the instant coffee in 3 tbsp hot water and then don’t use any milk at all. Basically, you need to make sure you’re only adding 3 tbsp of liquid, total. Thank you for the clarification! 🙂 I appreciate it. I’m planning on making the cake in advance, would you happen to know the best way to store it in the meantime? Say… for 3 days? Does it need to be kept covered in the fridge or should it be kept room temperature? I’m a little worried about leaving it out for a few days in the summer heat…but I also don’t want the cake to toughen up in the fridge. Any advice? I haven’t tested the frosting with gel colour so can’t advise how that would turn out – only how it is written in the recipe. I hope you enjoyed eating it! 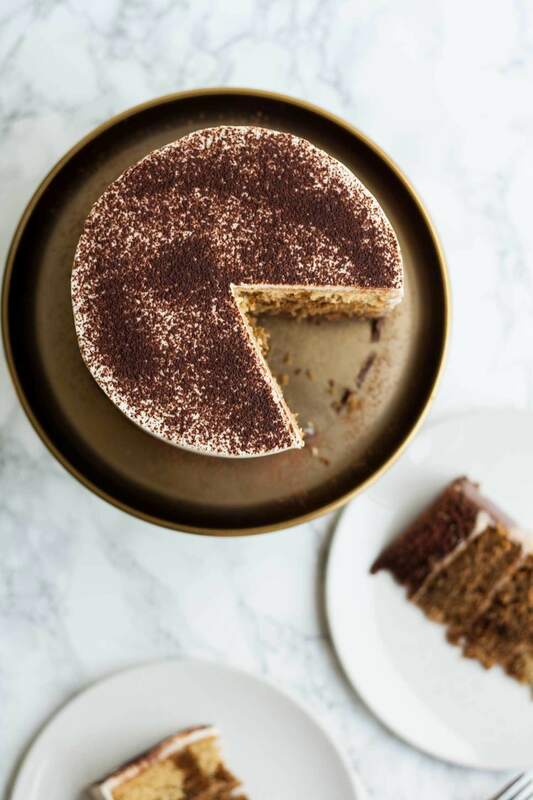 I’m looking to try this cake for my mums birthday as it looks amazing and she loves tiramisu so what better way to celebrate! 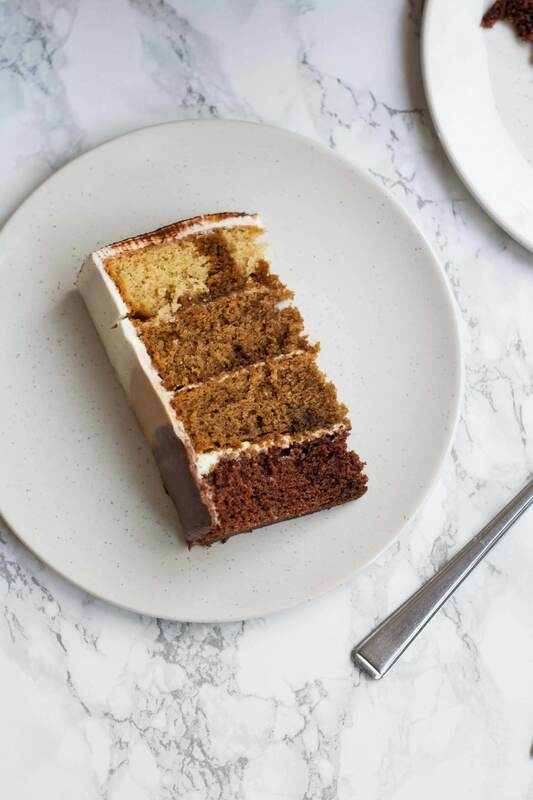 I was just wondering if you put the coffee syrup on all the layers of cake, as I wanted to check if that would take away some of the vanilla/chocolate flavours from those two layers? Hi Rachel! I did put the syrup on all the layers, yes. I found that I could still taste all the flavours – altogether it tasted like tiramisu which is what I was aiming for! If you wanted to leave it off you absolutely could do though 🙂 but it’s delicious with! Hope you love the cake! Hi! What are the measurement of the cake pan which you used? This cake came out amazing! Thank you for the wonderful recipe. This cake looks so good! Do you think it would still be good if the cakes and frosting were made a day before and left in the fridge (or counter?) then assembled the next day? I love this cake. I made it a few weeks ago and it came out aaaaaaaamaaaaaaazzzing. I made an 8 inch with three big layers instead of four and my cake was very tall. The cream was everrrrrrrryyyythinnnnnng! SO DIVINE! I’m not a cake person but this was to die for! i decided to have a second attempt today and I don’t know what I’ve done wrong for my cake to sink right to the bottom! I didn’t even open the oven door. Do you have any idea? Thank you so much for sharing awesome recipe! I tried this recipe last night and, even though I haven’t cut into it yet to see the final result, I know something (if not someTHINGS) went terribly wrong… I just can’t figure out what or why. The consistency of the cake batter, and the cake itself, ended up a bit thick. I’m not sure if that was the point, so that soaking it wouldn’t destroy it, but I feel like it might end up a bit dry. However, the worst part was the mascarpone. Although I tried getting everything to room temperature, it curdled. Or at least I THINK that’s what happened. It was hard enough to mix as is but, after the additions of cocoa and espresso powder, everything turned into a kind of mush. And there wasn’t nearly enough frosting/filling to go around even though I put very little in between the cake layers and used very small/shallow 5″ cake pans. HI I would like to make this cake but have to make it in advance, will the cake keep for over a day? in fridge or no fridge. Im worried about the frosting becoming watery and lose its volume. Any help would be great Thanks! Hello Sasha. I’m 17 years old and still an inexperienced baker. I have an Christmas dinner around the corner and want to impress the family with this gorgeous cake. I am a bit nervous about using a food processor, so will I have the exact same result if using the old-fashioned hand mixer by mixing the wet ingredients first and then adding the dry ingredients?